Early Friday morning I'm flying to North Carolina, which is where Cardgrrl is living these days, for a week of slightly belated holiday celebration. I wish I were there already. Something just prompted me to look at my total page-view stats via Google Analytics, which I had never done before. (Just over 1.1 million. Thanks for asking.) I used to look at my traffic reports every week or more, but now it's very rare. I just don't care much. Anyway, in the process of setting the date range to the entire life of the blog, I noticed a traffic spike that I had never noticed before, occurring on September 14, 2011. It was nearly twice as big as the spike I got when I got backroomed by the security goons at the Cannery in 2009. I was deeply puzzled as to what I might have written that got that much attention. It appears to have been this post about the ethics controversy at the Epic Poker League. I can't tell exactly where the traffic came from, because the main referral source is listed as a link-shortening service, so I'm guessing that somebody with a big Twitter following posted a shortened link to the piece. Strange what gets attention and what doesn't. Some posts are deeply personal and important to me and get slaved over for hours and hours. Others are just whipped off from the top of my head and involve things on my mind that day, but which I consider of no lasting consequence. The degree of correlation between how important I deem something/how much work I put into writing it and how much attention it gets appears to be pretty close to zero. Mystery solved. I remembered that my friend Shamus got his biggest blog traffic spike ever when Daniel Negreanu posted a link to something he wrote. Given Negreanu's outspoken disdain for the EPL, it occurred to me that he was a likely source. A little digging, and, sure enough, he tweeted a link to my EPL post using the shortening service I had found on the exact date in question. It was then retweeted by others, including Kathy Liebert, Wicked Chops Poker, and others. I've been thinking quite a bit more about that hand I played with Rob at Planet Hollywood, written up here. He describes it from his perspective here. Specifically, I've been going over what I would have done if I were in Rob's seat, playing his cards, against an opponent like me. My thought process got churning because of a series of comments posted to Rob's blog. Rob, I think your better play would have been to take advantage of your position and use some pot control by checking the turn. This way you can turn your hand into a bluff catcher on the river or bet for value if they check again. Well, ohcowboy, I never really considered that. With so many draws out there, giving a free card seemed way too dangerous. Of course, if he already had made his draw, that wouldn't matter, but, I thought protecting my hand was the way to go. it's actually a valid suggestion by ohcowboy. Here's why! If you're planning on folding to a check raise knowing that Grump is highly capable of making this play with a wide range of hands that include a lot of semi-bluffs then basically you are making your own hand meaningless. Thus your bet now becomes a bluff if you are willing to fold in a spot where grump is often going to check/raise his draws. Against this particular crafty opponent it might be better for you to outcraft him. Go for pot control on the turn here (which makes your hand look like AK/AQ) and be prepared to call almost any river bet. Sure you might give him some free river cards to his outs but if he is so likely to bluff then it's worth it. You can also bet the river for value if he checks. Against clever opponents you need to mix up your plays and go another level. don't let grump put you on a polarized range of hands. Don't be predictable against him. Of course make sure you keep these plays to those spots where you are mostly heads up against him. Other players will not comply. In other words, go a level up. Think about what he thinks you might have based on your play and take a step higher. If you do this every once in a while then Grump will not be able to read you as easily and make plays like this. PS. I look forward to a blog post where you try this and it fails and you curse my name. There are no rebates on my silly advice. I have read Vook's thoughts on his own blogs (here and here), and when commenting on other people's blogs. I have also met and played in a cash game with him. Through all these means, I have come to respect him as an analyst of tough situations. And you know what? I think he's right. On a board where there can already be completed straights and flushes, unimproved pocket kings really is not much more than a bluff-catcher, so you might as well treat it that way. Suppose Rob had checked back on the turn. I would still be unsure whether he had an overpair that feared the straight and flush, or an A-K type of hand that had missed completely. Assuming that the river card is not a fourth diamond and not an ace or king, I would indeed be very likely to bet. It would be some odd mixture of a bluff (hoping he would fold an overpair if that's what he had) and a value bet (hoping he would hero-call with ace-high, which my pair of 6s would beat). How much would I bet? Probably right around $40, the same amount that Rob bet on the turn. So for the same $40 he bet and lost on the turn, he would instead get a showdown in a situation where he well might win, if my river bet is a bluff or a value bet with a pair lower than his kings. Suppose a diamond came on the river. What then? Would I bet? I think I probably would. A $40 bet to win what's in the pot is well worth a shot, because (A) there's only about a 50/50 chance that Rob has a diamond in his hand, and without one he will never call, and (B) if he has any diamond other than the ace, he still might fold, fearing that I have the ace. If an ace or king had come on the river, I think I would be much less prone to bet, for two reasons. First, any component of value bet is now gone, and what would have been a semi-bluff on the turn is now a pure bluff, which is harder to make profitable. Second, I would have to worry that Rob had just made a set. He would then be much less likely to fold, because it would remove all the two-pair and sets from my range of hands that he would have to worry about. If he only has to worry about being beat by a straight or flush, he'll be far more likely to call than if he has to worry about everything I might have that can beat one pair. Therefore, a bluff is much less likely to succeed. The obvious objection to this line is the one Rob expressed--checking behind on the turn may give a free card that completes a draw to beat him, when a bet on the turn might win the pot. That's true, and David Sklansky says that in mathematical terms one of the worst mistakes you can make in poker is failing to bet when doing so would win the pot. But weighted against that consideration is this one: You want to play big pots with big hands, and an overpair simply is not a big hand when the board is as scary as the one we're talking about. It took me a while to come around to Vook's point of view, but I have. I think the balance comes down on the side of playing conservatively and defensively rather than aggressively in this specific situation. A $40 investment is more likely to win the pot as a bluff-catching call on the river than as a bet on the turn, given the specifics of this board and this opponent (i.e., me), and it doesn't risk getting you pushed off of the winning hand. Very early in learning about poker, I heard that when you bet or raise, you should always know in advance what you will do if an opponent raises back. You don't necessarily have to have a plan for what you'll do in case he calls, because you'll get another card and can re-evaluate then. And obviously you don't have to plan what you'll do if he folds, because the hand ends. But you should know what you'll do if he raises--whether it will be to fold, call, or reraise. I doubt that any of us manages to do this every time, but I think it's a worthwhile aspiration. From Rob's reaction to my check-raise, it was clear that he had not thought through what he would do if I raised. (I don't say that as a criticism; I'm as guilty of stumbling into such "now what do I do?" moments as he is.) If he had, he might have realized that it was a situation in which a check-raise from me would put him to a very difficult decision, since my range would be an indecipherable mix of made hands (straights, flushes, and sets), semi-bluffs, and pure bluffs. Given that, he might have then realized that $40 or so would be better invested on an easy, automatic river call--no matter what came--than on a turn bet that could lead to a costly mistake. For the last 24 hours or so, when my mind has drifted back to the question, I've asked myself whether I would have made what I now think is the right play (i.e., checking) had I been in Rob's shoes. And I honestly don't know. I think maybe I would have on my best, most analytical, A-game days. But I spend a lot of time playing on what amounts to auto-pilot, and the auto-pilot mode says to keep betting a hand like pocket kings--especially in position--until something grabs me by the throat and makes me stop. So I might well have done exactly what Rob did, and ended up in the agonizing no-man's-land that he did, unsure of where I was or what I should do. Anyway, the more I've thought about it, the more I think it's an interesting hand, full of potential for learning and debate. This morning I took a hike up Lone Mountain, which is at the far northwest edge of the city. You can read all about how to get there and what to expect here. I took a series of eight snapshots in a nearly 180-degree panorama and then digitally stitched them together for you. (Right-click to open link in new tab will get you the biggest version.) This is looking southwest over the city. You can just barely, on the horizon on the far right, the buildings of downtown, and the Stratosphere is the last structure sticking up. My friend Stacey, aka @LasVegasPokers, has for a couple of months been running a new web site, FundAPetMiracle.com. You can donate to specific animals that need specific treatments that their owners or caretakers won't be able to afford without support from donors. Now, personally I have some qualms about the general wisdom of administering chemotherapy and/or radiation therapy to older animals with tumors or cancer, which is the nature of a lot of the projects listed. I worry that sometimes (though surely not always) such treatments, though well-intentioned, actually cause a net increase rather than decrease in suffering, and as a donor I'm not sure how to tell which of the pets with tumors or cancer might fall under that description. But there are many others about which I have no such concerns. I have thrown small donations via PayPal to an adorable obese beagle (Albert) who needed lots of physical therapy, for instance, and to a shelter for the extra expenses it faced when it took in 40 abandoned kittens at once. Here's a local TV news clip about one of the animals for which a fund has been established. Please take a peek at the site, and if you find a dog or cat whose needs tug at your heart, make yourself feel good with a donation. I understand that today is the last day to vote, here. Might I suggest throwing a click to Hard-Boiled Poker for best blog? I spotted this sign a few days ago in the Luxor poker room. 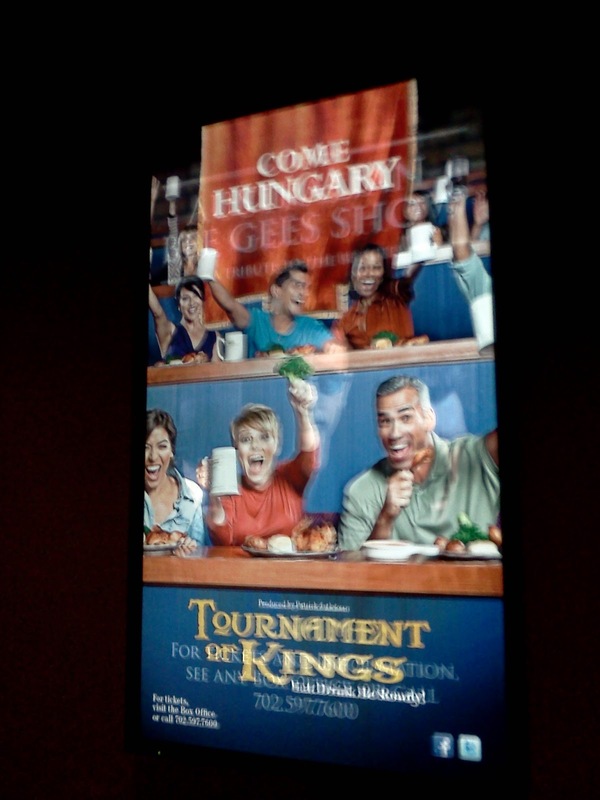 It's an electronic sign, and was starting to change just as I snapped the photo, which is why it has the Bee Gees thing fading in. I just got home from 4 1/2 hours at Planet Hollywood, where I was playing with Rob and his friend Prudence. I had a good night--one of my best in several months, actually. Most of what I won came from pots where I had the best hand, but two sizeable ones were out-and-out thievery. The latter is always more fun to talk about, so I will. Villain is a tourist, quite a bit tighter and more disciplined than most of them. Completely ABC, transparent. I had noticed that he was reluctant to put a lot of money in with one-pair hands. This is mostly a commendable and appropriate thing, but it also makes him a good target for bluffing. I had been playing tight and was getting respect when I showed any aggression. He raised to $7 from under the gun plus one, which immediately narrowed his hand range enormously--certainly nothing outside of the top ten list, and probably only A-K, A-Q, and pocket jacks or better. I was in the small blind with 4-5 offsuit. This is a situation where I would normally fold, but some internal imp prompted me to take a flyer and see what might happen. I was the only customer he hooked. Flop was J-7-8 rainbow. I checked, he bet $15, and I called with just a gutshot. It would have been nice to hit that, but mainly I was hoping that he was on A-K and would check behind on the turn in surrender, setting me up to steal if the river was not an ace or a king--an out-of-position float, basically. But fourth street made it more interesting--another jack. I checked again. He bet again, $30. I decided to represent the jack, and check-raised to $80. I'll interrupt the story to note that just a bit under 3x is my favorite check-raising amount. I mentally think of it as "3x-minus." My observation has been that 3x or more blows too many mediocre and drawing hands out of the water when I have the goods and want a call. 3x-minus does that less, yet it usually does not give the correct odds for a draw to call, the way a minimum (2x) raise would. Naturally, when I'm bluffing, I try to follow the same pattern. It's not really that I expect most players at this level to be paying enough attention to my check-raise sizes to notice if I were to deviate from my norm--I'm not doing it often enough for that. Instead, the reasoning is that a 3x check-raise is so standard that making it just a little less than that looks like I'm trying to get a call, without being the minimum raise that actually is easy for an opponent to call. To put it another way, it's either a good amount to value bet, or a good amount to look like a value-bet. Back to the story. He thought quite a while, but eventually called. This was the first time I had seen a significant crack in his demeanor, and he looked seriously uncomfortable. I imagined that he was thinking something like, "What have I gotten myself into?" The turn card had put a second diamond out, so I now believed that he either had an overpair, or he had the A-K or A-Q of diamonds and was calling in the hope of hitting the nuts on the river. For that reason, if another diamond had come, I probably would have had to shut down. River was the ace of spades. I quickly moved all-in for about $120. He thought only a few seconds before mucking. The best part was when the guy on my left, a very experienced player (and, I think, an off-duty dealer) told the villain, "I don't know what you had sir, but that was definitely a good laydown." Hee hee! I take it back. That was the second-best part. The best part was winning the pot with complete air, and with what was very nearly the worst possible hand one could have for that board. Much later, I had moved seats to be between Rob (on my immediate left) and Prudence (two to my right) for convenience of chatting. That seat also put me on the immediate left of the table's live one, a young man who had gotten lucky to build his stack to about $500, and was now in the inevitable process of redistributing it back to the other players. Rob and I both had in the vicinity of $400 stacks, I believe. It is important to note that Rob had been basically spinning his wheels for most of nearly three hours at this point. He was two seats to the left of the table maniac, but had not been able to take advantage of that prime spot. He was just up and down relatively small amounts, never able to make a big score--until just a few minutes before the hand in question occurred, when he nearly tripled up in one hand. This meant that he was sitting on a meaningful profit that had not yet settled in emotionally. I judged that he would be less willing to risk losing it than usual, because his mindset would be, "I finally got ahead after three hours of nothing, I'm not going to give it away lightly." There is a second important piece of back story. One of the disadvantages of being a poker blogger is that people who pay attention to your writing will have an enormous amount of information about how you play. I had a bit of insight about Rob that I thought would be relevant. About a month ago, he did a long post in which he talked about how reading an old post of mine (here)--which makes the point that playing scared in no-limit poker is going to lose you money--had caused him to rethink his approach to no-limit poker. In his post, Rob admitted that he had a tendency to see a significant profit in front of him and go into lockdown mode to prevent losing it. All of which meant that I thought Rob was a ripe target for stealing, because his new-found wealth should cause an exaggeration of what was already a tendency he struggles with. Now, I didn't take notes in the immediate aftermath of this hand, because it wasn't until on my drive home that I began thinking it might make good blog material. So I'm a little fuzzy on the details. But the flop had a 6 and two diamonds, and I believe it was 10-high. I think it might have been 6-9-10, because I recall that it had given me bottom pair, a gutshot straight draw, and the backdoor flush draw. That's pretty close, anyway. I checked. Rob bet $20, I think. I called. The turn was a small diamond--deuce, maybe? I checked again, though with deliberate hesitation. I had not yet decided what I would do if he bet, but if he felt inclined to give me a free card, I'd take it, and if he bet, I wanted him to have noticed the deviation from my usual rhythm, and possibly interpret it to mean that I had been wavering between betting out and going for a check-raise. I thought that impression, if I had reason to call on it, would look more like a flush had gotten there. He bet $40. I thought a bit and check-raised to $110--the logic of the amount being the same as described in Hand #1 above. I wanted Rob to read me for the flush, because a check-call/check-raise was entirely consistent with having made a small or medium flush. I guessed that he did not like seeing that third diamond peel off, and that fact, coupled with the already-identified tendencies to protect a nice win (the acute one compounding the chronic one), would make this a convincing line. He took a very long time to decide what to do--at least three full minutes. The longer it went on, the more obvious it became that he had either aces or kings, with one of them being the diamond. I hoped that it was kings, for two reasons. First, Rob has post after post after post about how he hates pocket kings and how he always seems to lose with them--his personal kryptonite hand. Feeding into a player's pre-existing belief system makes it that much easier to manipulate him. Second, if he had only the king of diamonds, he would have to worry that I had limp-called pre-flop with something like the A-2 of diamonds and he was already drawing dead. There was yet another psychological factor at work. Right after Hand #1, I had texted Rob to gloat privately about having pulled off the big bluff. I wasn't sure if that fact would now cause him to think, "He's doing it again," or, conversely, "He wouldn't dare do that again after having told me about the earlier bluff." That could have worked either for or against me, and I didn't know which would predominate. But finally Rob folded. He was visibly perturbed, and left the table for a few minutes--to clear his head, I assume. I felt bad about that. I don't like inflicting distress on my friends. But I trust that he understands and accepts the terms of the game. Chief among those is this premise: that we will all be using every legal tactic and stratagem we know, every scrap of information we have at our disposal, every bit of skill and reasoning we can muster, every means of deception and psychological trick we can pull off, in order to take each other's money. It is ruthless and cutthroat, but that is the essence of the game. When friends are involved, I will occasionally do a few playful things just for fun that I wouldn't ordinarily do, especially in small pots--play a goofy hand, show a bluff to rub it in, or whatever. But when there's a big pot brewing, I am going to try to win the money by any legitimate means available to me. Because I have more information about my friends' tendencies, I can more accurately tailor my line to maximize my chances of winning. This works both ways, naturally, since they know a lot about what I am and am not capable of doing. Which is a long way of saying this: I definitely don't soft-play friends (and I would be appalled if any of them soft-played me). I don't play them harder or in a more tricky way than I would play other opponents just because they are my friends and I'm specifically targeting them, but at the same time, knowing more about them means that I can often exploit them more than mercilessly than I can strangers. And that, in turn, means that I should exploit them more mercilessly. That might seem antithetical to friendship, but in the insular sphere of a poker game, it is not. When Rob had had a chance to get back in the game mindset (and after he had won another good pot, which always helps remove the sting of a lost one), I offered him an honest exchange of information about the hand. He agreed, and I explained my cards and my rationale. He told me that I had it nailed--he had had pocket kings, including the diamond. After a few seconds' pause, he realized the implication of what I had told him. "You mean, you called my raise from out of position with 8-6 offsuit?" Yes. Yes, I did. In this case, obviously, I was not running a pure bluff as in Hand #1. It was a semi-bluff. Even if he had called me, I could have caught either of two 6s for trips, any of three 8s for two pair, any of three non-diamond 7s for a straight. At the time I made the raise, I also thought there was about a 50-50 chance that any diamond would also give me a winning flush, though this turned out not to be so. As a side note, had Rob pushed all-in over the top of my check-raise, I would almost surely have folded. But I knew that my line put him in a difficult position, one in which it would have been hard for him to do that unless he happened to have made the nut flush, an unlikely occurrence. One of the things I was taking advantage of was the knowledge that he knew me to be capable of some way-off-the-beaten-path moves. I knew that he perceived me as a difficult-to-read and potentially dangerous opponent. He would know that I might be running a total bluff, but that I also might have him crushed, with a set, a flopped straight, a turned nut flush, or whatever. When my range contains so many hands that could cost him his entire stack if he guessed wrong, I was betting that he would not want to risk that much money in the face of that much uncertainty. Here's the pithy lesson I take from this second hand: Know your enemy, especially when he is your friend. See Rob's version of the story here.